When I was first married our family became whole with our first “kids,” Bear and Moose, both Golden Retrievers that we could not have loved more if they were two-legged kids rather than four-legged. 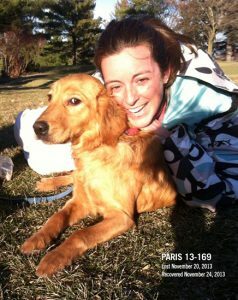 We then added to our family and adopted the sweetest little girl, Paris, from Retrieve a Golden of Minnesota (RAGOM). It was love at first sight. She was a puppy mill dog and of course came with her own adjustment issues (though don’t we all?). On a very cold fall night, she did her “great escape” and somehow found her way out of our backyard. You never think this will happen to you, and I was immediately overwhelmed with what to do, who to notify, and how to go about finding her. I contacted the RAGOM Lost Dog Rapid Response (LDRR [which later become the Retrievers]) team, who immediately gave me tools and information. They assisted with guidance on what to look for, how to get awareness out and ultimately with setting a live humane trap to catch her. After five very long days, we were able to capture her in a golf course not far from where she first ran. It was one of my happiest days. The above picture was taken seconds after finding her. She continues to teach me so much everyday. I am forever thankful to the LDRRT, for without them, my family would not have been reunited. It is because of this that I have a new passion and understanding for assisting other families with searching and hopefully reuniting them with their lost four-legged family member. I’m a night owl. A few years ago, I got into the habit of browsing the Lost & Found ads on Craigslist late at night, just to see what people had lost. Once, I noticed that a found Golden Retriever looked exactly like a lost Golden in another ad on the same Craigslist page. Somehow the owner and finder hadn’t connected. So I sent an email to both, and that’s all it took to get that dog back home. That simple act of reuniting a dog with the family who was frantically searching for him was powerful, and I’ve been hooked on lost dog searches ever since. As a volunteer for Retrieve a Golden of the Midwest, I proposed the formation of the Lost Dog Rapid Response team and helped develop the team’s organizational structure and processes. Over the past few years, I’ve been involved in many boots-on-the-ground searches for missing dogs. I’m always struck by how intense they can be—days of persistence, planning, pursuit, sweat, doubt, faith, blood, tears, coffee and Google maps. And then, suddenly, unpredictably, I hear that the dog is found, or I see it in a trap, and the search is over in an instant. I heave a sigh of relief and, if possible, at last meet this dog I’ve been focused on for so long. And as we’re mopping up from that search by pulling up signs and taking down flyers, and I’m finally getting back to my own dogs and house and laundry, I get the itch to find the next lost dog. Shortly after the capture of Zoey and Sage, the stray Golden Retrievers in Talmoon, MN. I was a fan of the Retrievers for about a year, and I was blown away by their work. I become Facebook friends with a member of the team, and when a dog from the Duluth area was lost, she asked if I could join the search. I said yes. We never found that dog, but during the search, we were able to reunite two other dogs with their families. I learned so much from working on that dog and met some amazing people. When The Retrievers started looking for volunteers to join the team, I was excited to give it a shot. I’m so happy I did. I can’t begin to tell you how wonderful this group of people is and how much I have learned from each of them. It’s hard work but the rewards are worth it. Nothing beats seeing a family reunited with their dog. I have always been a rescuer of the furry and feathered. My mother never knew if i was bringing home birds, horses, dogs or cats. My love for animals brought me to adoption, rescue and ultimately, the Retrievers. 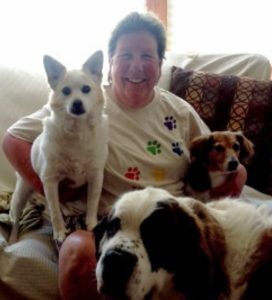 My wife and I had become involved with Northwoods Humane Society through adopting multiple dogs and cats, volunteering and becoming a board member. We have three dogs and three cats, all either adopted or rescued. Never a dull moment in our house! 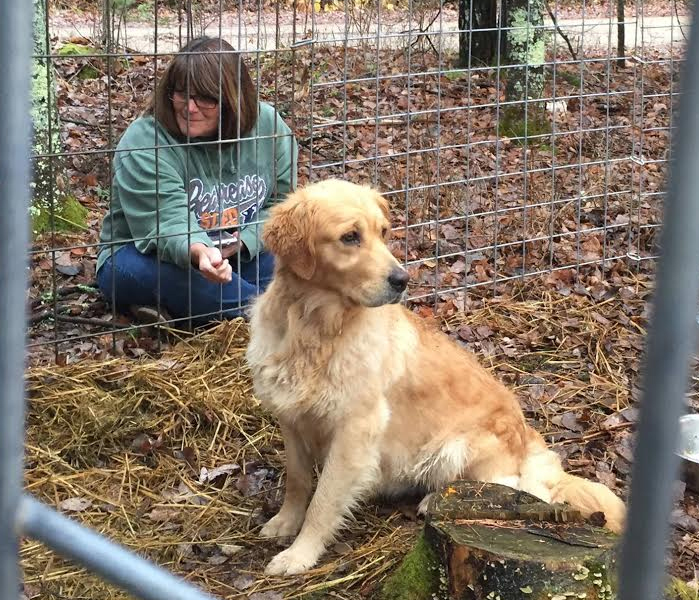 When a foster dog went missing, we started a ground search and posted to Facebook where someone said, “Have you contacted the Retrievers?” The foster mom filled out the form and our journey of how to search for a lost pet started. I met Natalie when a newly adopted dog went missing, and from there I knew I needed to be more involved with the Retrievers. I have learned so much about the right way to find a lost pet and have been able to help many other people on the same journey.